Each One Tell One Hosts Golf Fundraiser – Each One. Tell One. 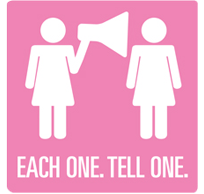 RENO, Nev. (Fox 11) — Each One Tell One is an organization that raises awareness for early breast cancer detection. Genoa Lakes Golf Club & Resort partnered up with Each One Tell One to host a fundraiser. Founder and President of Each One Tell One Heather Reimer along with Owner of Genoa Lakes Golf Club & Resort, Fred Gartrell joined us in the studio Thursday morning to tell us all about their event.